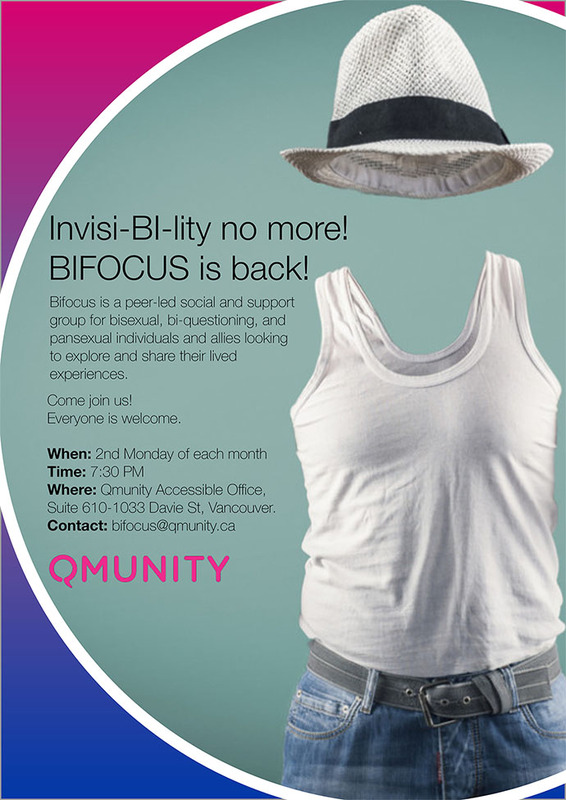 Bifocus is a Vancouver-based, peer-led social and support group for bisexuals and non-monosexuals. Non-monosexual may be defined as anyone who experiences their sexuality or attraction as connected to people of more than one gender. This attraction may not necessarily be at the same time, in the same way, or to the same degree. This umbrella term can encompass a wide variety of identities including bi-, pan-, omni-, ambi-, or poly-sexuals, queer, fluid, heteroflexible, homoflexible, bi-questioning, and many more! Biphobia, racism and transphobia intersect such that transgender people and people of colour who identify as non-monosexual experience the highest health disparities within the community. Given the systemic marginalization that non-monosexuals face, building strong community support systems that help build connection, self-worth, and resilience are crucial. Through a talk-based support group, Bifocus offers a community where non-monosexual folks of all genders (transgender, two-spirited, non-binary, gender non-conforming, cisgender and others) can exchange diverse perspectives on their issues and experiences. Each month, alongside our sharing, Bifocus delves into a theme such as biphobia and invisibility, bisexual health and mental health, relationships, loneliness, or celebrating bi-culture. We share feelings, fears, knowledge, and questions in a non-judgmental space, striving to empower folks of all backgrounds. If you have a patient or work with a community member who you think would benefit from the support of Bifocus, please let them know about our monthly meetings. When: The second Monday of each month, 7:30-9pm.